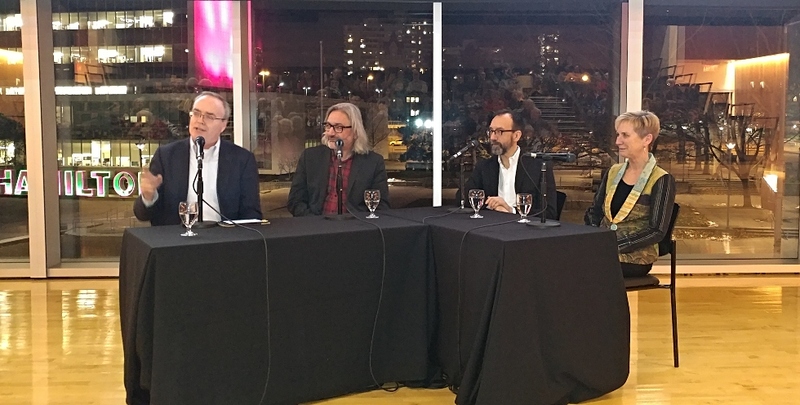 Acclaimed authors (from left) Terry Fallis, Gary Barwin, Trevor Cole, and Kim Echlin recently took part in an event hosted by McMaster University Library in celebration of the 20th anniversary of McMaster’s Mabel Pugh Taylor Writer in Residence program. Is it possible to make a living as a writer? Do literary awards matter? Is there a “right” way to approach the creative process? Those were just a few of the topics discussed by four acclaimed Canadian authors at Finding the Words: The Art of Writing,an event hosted recently by McMaster University Library at the David Braley Centre in downtown Hamilton. The event, held in celebration of the 20thAnniversary of the Mabel Pugh Taylor Writer in Residence program, a partnership between McMaster’s Department of English and Cultural Studiesand the Hamilton Public Library, featured award-winning authors Gary Barwin, Trevor Coleand Kim Echlin– all past writers in residence – as well as moderator, celebrated author and McMaster alumnus Terry Fallis. Speaking to members of the McMaster and Hamilton communities, each author shared their thoughts on the art and business of writing, discussing a number of topics including their own writing processes – which ranged from creating highly planned outlines, to more intuitive approaches – to the pros and cons of literary awards. They talked about the importance of carving out time to read, and about some of their favourite childhood books such as The Hobbit and Heidi. As well, they shared their personal insights on the economic realities and financial challenges of writing, discussing a recent study by the Writers Union of Canada which revealed that over the past ten years, writers’ incomes have dropped 78%, with a 27% decline taking place in the last three years alone. Kate Cayley, the 2018-19 Mabel Pugh Taylor Writer in Residence. 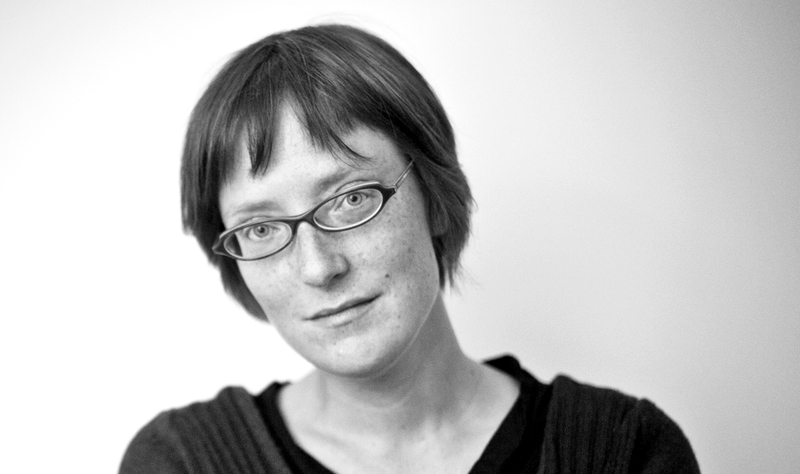 Kate Cayley is the 2018–2019 Writer in Residence. From now through December, she will have on-campus office hours on Tuesdays and Thursdays from 9 am until 2 pm in room 312 of Chester New Hall. Starting in January, she will have office hours at the Central branch of the Hamilton Public Library. Interested writers in both the McMaster community and the general public can make an appointment to meet with Cayley by contacting her at englwir@mcmaster.ca. *McMaster University Library’s William Ready Division of Archives and Research Collections includes of archives of a number of Canadian literary icons including Farley Mowat, Pierre Berton, Margaret Laurence, Stuart McLean, Austin Clarke, Sylvia Fraser and Peter C. Newman, as well as Canadian publishers McClelland & Stewart, Key Porter Books, Macmillan Canada and Clarke Irwin.